This page provides information related to our book such as a list of errata, reviews, comments, an excerpt, and other information that might be helpful to our readers. If you look for a sample from the book, you might want to dig for for the April 2000 issue of C++ Report. It contained an excerpt from the book. The excerpt describes the mechanics of stream buffers, which are an important extension point in the IOStreams framework. Due to space limitations in the printed media the excerpt was shortened, but the complete chapter is available at EXCERPT . A couple of readers expressed interest in the source code that is printed in the book. Unfortunately we never found the time to it put anything together. However, an enthusiastic reader, Klaus Wittlich of SAE IT-systems in Cologne Germany, volunteered to implement all examples from the book and made them work under Microsoft Visual C++.NET. The result of his effort is available as a zip file (309 KB); for access to the source code go to CODE . We received a request for a seminar on IOStreams and Locales and put together a 5-day course based on the book. The added value of the seminar is the opportunity to do hand-on labs and implement real-life solutions using iostreams and locales. Plus, in a course you can ask all the questions that the book left open. For information about the seminar go to to SEMINAR . The publisher Addison-Wesley provides information about our book on their web site at www.aw.com/cseng/titles/0-201-18395-1/ . You'll find the table of contents, the preface, and other related information. 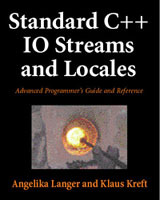 The book has been translated to Chinese (ISBN 7-115-09052-1) and Polish under the title "C++. Biblioteka IOStreams i lokalizacja programów" (ISBN 83-7361-739-6).